Birthdays have never been a big event in our household so when I went into my office on my birthday to check my emails I was not surprised to see any emails from my sisters, but one from Eilidh, how did she know?! Not birthday wishes but, please can you write another 650 words.....by tomorrow would be great! As I write this we are half way through July and have been enjoying some great weather. July has always been the busiest month of the year for our shop and cafe, this year is no exception. Trade this month to date has been a massive 30% up on last year! I am not sure if more people are staying at home this summer and spending more time and money at home or whether people are just far more aware of where their food comes from and want to stock their fridges with food with provenance. I got the chance of getting a story on the BBC earlier this week. Never one to turn down the chance of a bit of PR I managed to persuade the reporter that the upturn in PYO would make a far better story than a story on migrant labour. She took the hook and I got good coverage on the BBC news. The Herald and the Scotsman both picked up on the story as well. 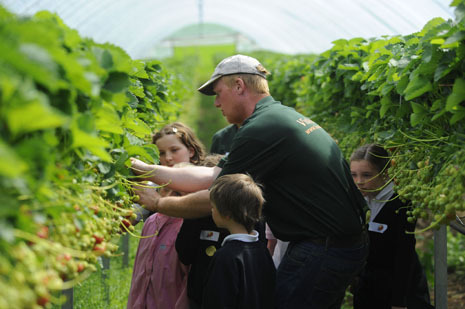 It resulted in a lot of local PYO farms getting a mention in the press – great result for all. Although The Scotsman chose to focus on Stenton Farm in East Lothian, I am sure James and Barbara would have been delighted of the publicity if they had not closed a couple of years ago! Only the Scotsman could make a blunder like that! I was not very popular with Kirsteen or the staff as the extra publicity filled our car park and over flow parking by 11am on Thursday. To top it off our power went off at 11.30. You do not realise how much you rely on electricity until you don’t have it! I was not at home; I was at a RHASS board meeting. That is the third time that we have had power failure when I have been in that board room! Kirsteen was not at all interested when I came home chuffed to bits that I had got the Deputy Steward’s job in the Food Hall! Our fruit started a bit later than expected, we did get going in May though. It is important that we get our early crop picked before the end of June so that we can get it replanted for the late crop. We had one block in Spanish tunnels that was very late and we did not get started until mid June. We were sure that we were going to have to plant the late crop in the bags outside then transfer the bags in mid July, but no nature has a great way of sorting its self out. The really hot weather at the end of June meant that we picked this block very quickly and made our planting deadline. The late crop is now greening up nicely and the pickers are getting stuck into picking the mid season crop. The Spring Barley and Wheat is starting to turn now, they both look like being a good crop. Willie has sold the Spring Barley well so is determined that it will make the quality grades. 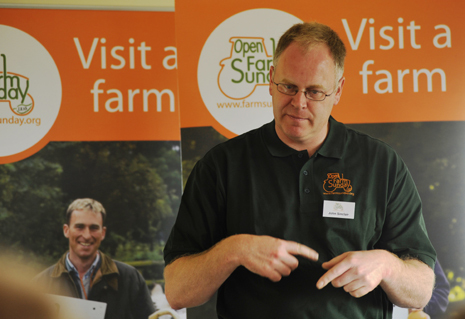 I finished off the last time talking about our plans for Open Farm Sunday. The press launch went really well, we managed to get Nick Nairn, much to the female staff members delight! The weekend went extremely well; it is great how so many of my neighbours and friends are so willing to give up their weekend to help out.